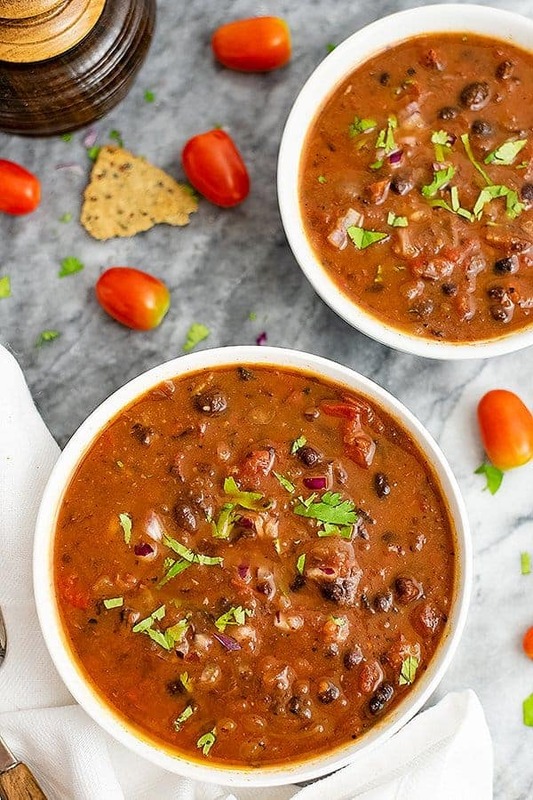 This 10 minute vegan black bean soup is the perfect lunch or dinner recipe! So easy to make, this healthy recipe is packed with flavor and will leave you feeling full for hours! 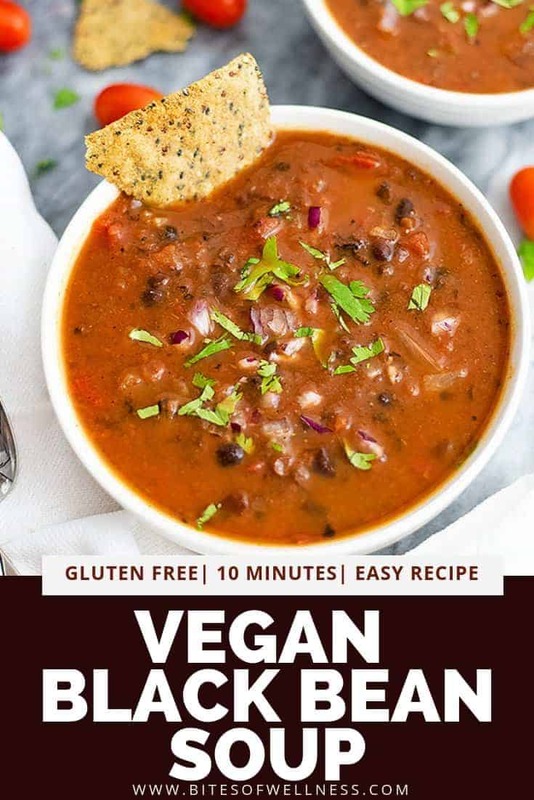 Naturally low in fat and gluten free, this vegan black bean soup is the perfect way to warm up on a cold day! One of the first dishes I ever made from scratch was black bean soup! At the time I was learning how to cook vegetarian and soup was the least intimidating recipe from the cookbook I bought! It’s crazy to look back at those days and see how far I’ve come! The thing is, I was right! Soup is the perfect recipe if you are just getting started with cooking! It’s so easy to make, it doesn’t have a ton of steps and you can make a big or small batch depending on how comfortable you are with the recipe! 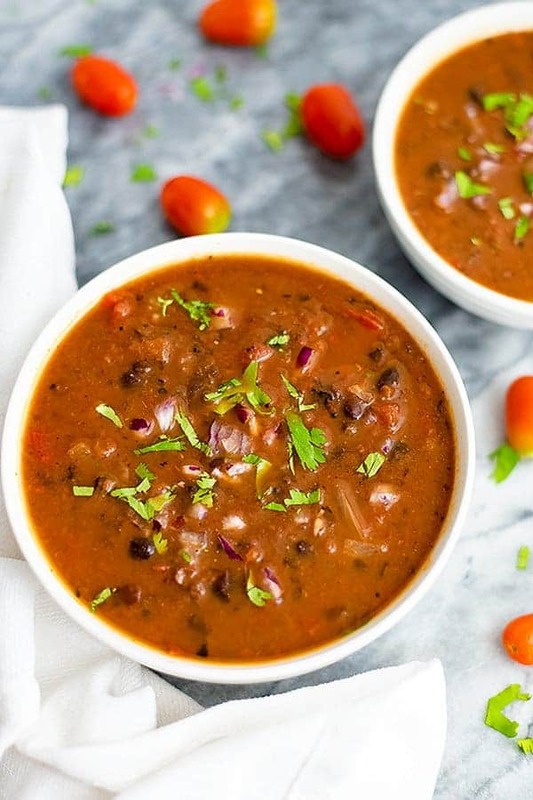 This recipe for vegan black bean soup only makes 2 servings, but you could easily double or triple that to feed a crowd! This is a recipe I make when I’m short on time but really want to have something healthy and filling for lunch or dinner! 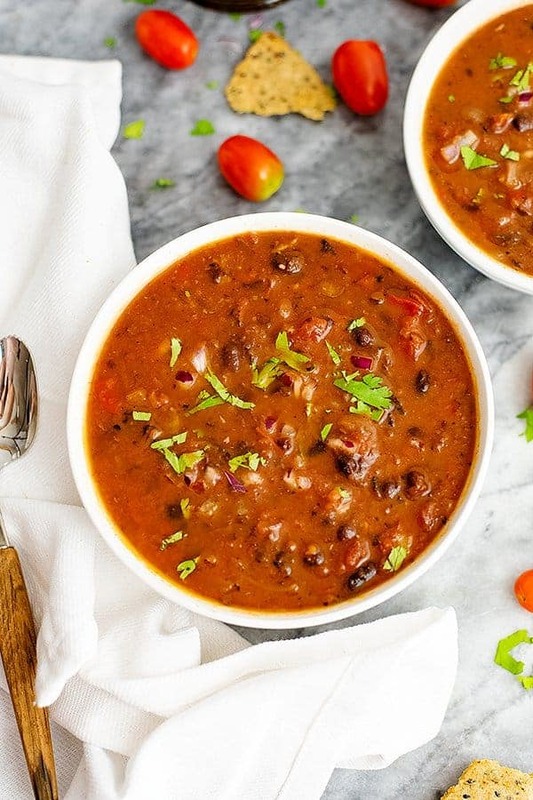 The key to making this vegan black bean soup in 10 minutes is using the right ingredients! The fire roasted tomatoes add a depth of flavor and the vegetable broth makes it taste like it’s been cooking all day! What ingredients do you need to make vegan black bean soup in 10 minutes? If you want to use dried black beans to make this recipe, you can follow the instructions in this post to make them in the Instant Pot or the slow cooker. You will need about 2 cups cooked black beans for this vegan black bean soup recipe. What other seasonings could you add? Add the rest of the ingredients and cover to cook for about 6 minutes. Take ¼ of the soup and blend it in the blender or use your immersion blender and lightly blend some of the soup. As the black beans break down it will naturally thicken the soup. 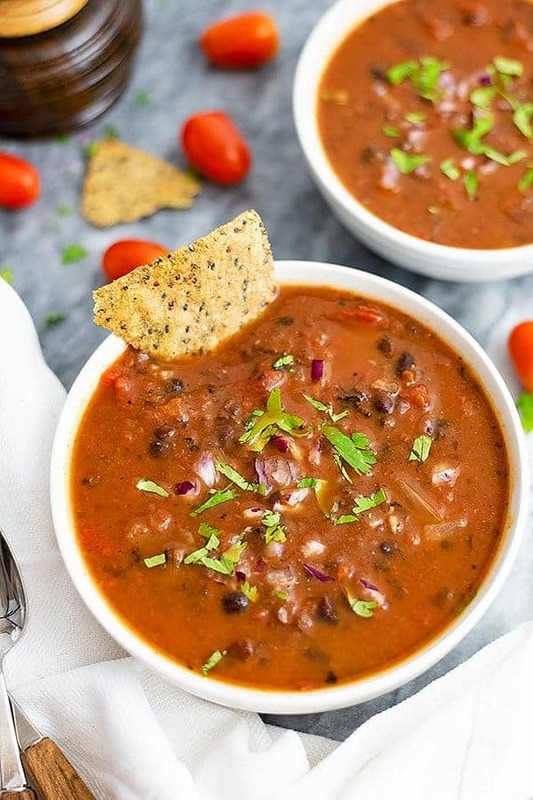 Vegan Black Bean soup is the perfect easy lunch or dinner recipe! Ready in 10 minutes, this healthy recipe is packed with flavor and will fill you up for hours! Naturally low fat and gluten free! Heat a medium sauce pan over medium heat as you chop the red onion. Spray the sauce pan with non-stick spray (or add 1 tsp. avocado oil) and add the onion. Allow the onion to cook 2 minutes. As the onion is cooking, rinse and drain the black beans. After 2 minutes, add the rest of the ingredients and put a lid on the sauce pan. Turn the heat up to medium high. Love this recipe, so easy and quick to make! No doubt I will be making this very soon, thank you!